The above is a photo of a little floral cushion which was embroidered with not only love but apparently with some blood, sweat and tears too. It was a gift from my talented sister on the occasion of that recent big birthday ending in an O! The big day came and went with lightening speed. Wind, rain and hail put an end to any form of horticultural outing so I christened my senior railcard with a journey into Liverpool and a wonder round the still fairly new Museum of Liverpool. We took our time and only ambled round half of what is on display so a return journey is on the cards. If you ever find yourself in the city I can recommend a visit. Once back home it was a pleasure to feast my eyes on the new cushion which is far to pretty to sit against and to think fondly of my dear little sis. I'm not quite sure how I will rise to the occasion when she gets to that milestone age! "Some folk fall into gardening, some are dragged into gardening, and a few others are born to garden. I fall into the latter category. There are a few marginal gardeners in my family but no one with what I now recognise as a single-minded passion. Just as a computer comes with certain pre-installed programs, I was born with a fully functioning 7.0 horticultural operating system, along with some specialised apps like an obsessive personality, an overactive imagination, an overly logical brain and a touch of ADD"
This has been declared the year of reducing the perilous mountain of books and virtual books that have been accumulating over the last year or so. Bookshelves are groaning out aloud and the Kindle is in danger of spontaneous combustion. I blame it all on joining a reading group when I finished work. This has been great for taking me out of my comfort zone when it comes to reading, but the new to me authors and recommendations for further reading have reached epic proportions. For the foreseeable future new book purchases and using my library card will be carefully monitored. What I will be doing is concentrating on what is already under the roof. Working on the logic that I will probably do more reading over the first three months and last three months of the year, the still to be touched gardening books are my immediate reading material. 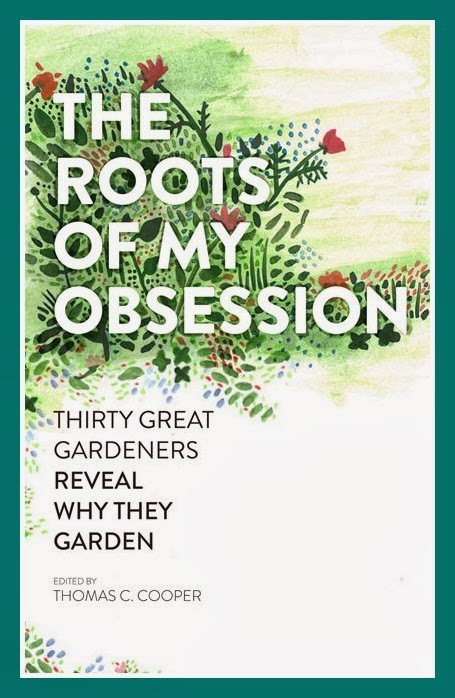 First candidate to emerge from the toppling pile has been 'The Roots Of My Obsession', in which 30 gardeners have been invited to write on the topic of why they garden. So the book is a series of short essays from the contributors who are in the main American and Canadian, although a few well known British gardeners also feature i.e.Fergus Garrett, Helen Dillon, Roy Lancaster, Anna Pavord, Penelope Hobhouse and David Wheeler. I had come across only a handful of the other contributor's writing before. In fact reading this book has left me with yet another list of authors and books that I would like to read which is defeating the object of the exercise somewhat. 'The Roots Of My Obsession', IBSN 13:978-1-60469-271-6 is edited by Thomas C. Cooper and is was published by Timber Press in 2012. It is available as a paperback and there is also a Kindle edition. A big birthday looms on the imminent horizon. If I was to say that it's one of those that end in an 0 and that I've just applied for a Senior Railcard, I don't think that you'll need any more clues. I've got mixed feelings about the forthcoming event which isn't really surprising but funnily enough I'm feeling happier about it than when I was approaching the big 4-0. I wonder why. To help celebrate this auspicious occasion himself, the lovely man that he is, has treated me to a special joint Christmas and birthday present in the shape of a DSLR camera with various accessories. It arrived yesterday either late or early depending on which way you look at it. I'm now on a steep learning curve as I get to grips with a new item of modern technology. There was no time to play yesterday whilst today after an initial bright start, soon turned on to one of those lights on before lunch time January days. I still managed to fit in a little time this morning though photographing some of the snowdrops in the greenhouse. They are coming on in leaps and bounds and are much earlier in flower than last year. I'm hoping that one or two favourites will get there this week so I should be able to practise more. I've already learned that I am not able to take a photo with the lens cap still in place. "Lifelong learning" - was a phrase that left my lips many times in my working days and this is a case in point - another challenge to look forward to. No doubt there will be many more lessons learned along the way. In the meantime it's back to studying the manual! Yes it's that time of year again and that first snowdrop order arrived in the post yesterday! This was the very first order that I've placed with Cornovium Snowdrops and I'm sure that I will return to order again in the future. Cornovium Snowdrops is a new small specialist mail order business selling "free range" snowdrops in the green. As the bulbs are all grown in the fair county of Cheshire this particular bulb did not have far to travel to reach me. Jane who runs the business with her partner, has been growing snowdrops for over ten years and has a magical winter garden packed with snowdrops, other bulbs as well as flowers, foliage and shrubs all chosen for winter interest. She has found that snowdrops thrive in the sandy acidic soil that she gardens in. My new snowdrop to give her the official name is galanthus plicatus 'Sally Passmore'. She arrived as you can see above a happy and healthy bulb, which with several noses, I'm sure will soon develop into a decent clump. I was really impressed with the well established roots. 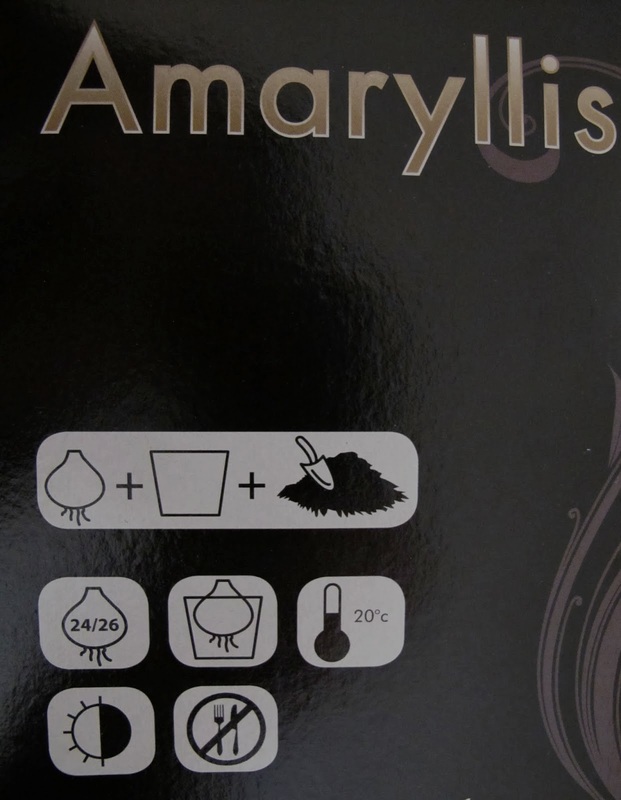 Furthermore my new bulb was extremely well packed (wrapped in kitchen towel and polythene bag before being secured in a newspaper envelope) within the shelter of a sturdy box. I'm looking forward to seeing Sally flowering and will post a photo when she does. I will be scrutinising her most closely every day from now on. I've other new to me snowdrop bulbs still to come from Avon Bulbs but it will be February before they arrive, so it is most exciting to have a new addition so early in the year. 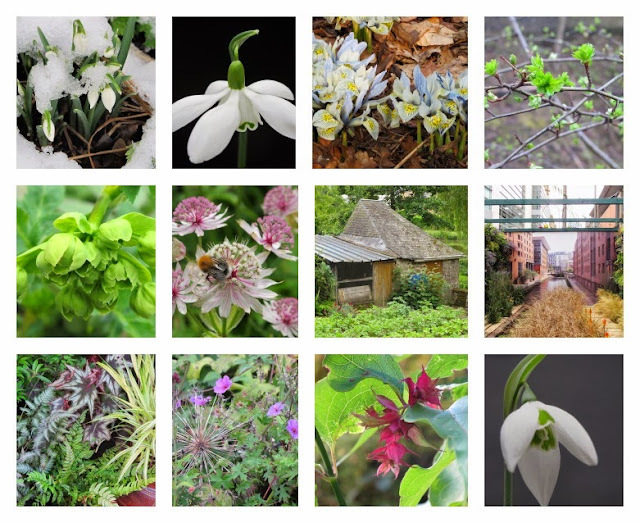 In addition to a website presence Cornovium Snowdrops can be found over on Twitter as @CSnowdrops and also has a Facebook page here where you can keep up to date with their snowdrop of the day photos. Do have a peek! ~ an extract from 'The Snowdrop' by Mary Robinson, 1758 -1800. 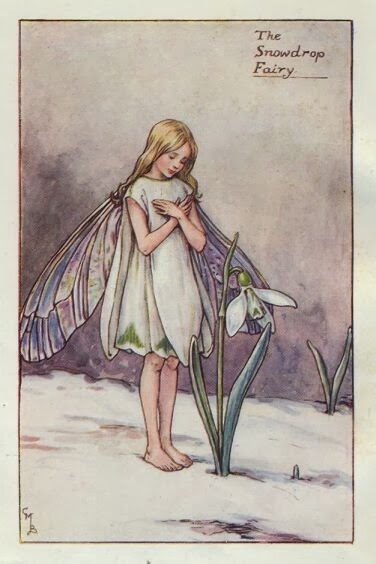 The illustration is 'The Snowdrop Fairy' by Cicely Mary Barker, 1895 - 1973. Almost Wordless Wednesday ~ Welcome To A New Year! So we have slipped into a new year. Above a few images from the old year which saw a long almost never ending winter, a brief but never more welcome spring, that memorable hot and dry summer rounded off by a mainly mild but moist autumn. I wonder what lies in wait this year! Thanks for stopping by in 2013 and for all your comments which are treasured. Whatever unfolds in the year ahead I hope it treats you, your loved ones and your garden/allotment most kindly.